Welcome to this week’s racing news. Apologies it is so late this week. Work deadlines and life got in the way! Sorry for the disruption. – The name of the event and the distance & type; e.g., Sutton 6, Road. – A small amount of detail from the event to give it some context; e.g., for last week’s LSU it could have read: ‘Long, biblical rain, insanely hilly. Fantastic’. – The results or a link to the results with any special mentions for performances. e.g., for the LSU it could have included ‘Special mention for Phil Roberts for best swim in an ultra marathon’. Feel free to add more of course, but this gives us enough to form a decent newsletter. This week is a tale of PBs, podium placing and the benefits of running after a heavy night… oh, and Roy’s back! Enjoy. Child minding rota = more racing! Who’d be interested in joining the Helsby winter Child minding circle? With border leagues and the winter XC coming up it can be difficult for both parents to run or even just one parent to run. Rather than miss out on the fun Fitzy and I came up with the suggestion that we take it in turns to mind the children at the race. It means that you might miss one race in X races (where X is the number in the child minding circle) but you’ll get to do X-1 races which is more than 0! – The adult(s) can bring a football, frisby, organise tag or hide and seek, cheering, etc. 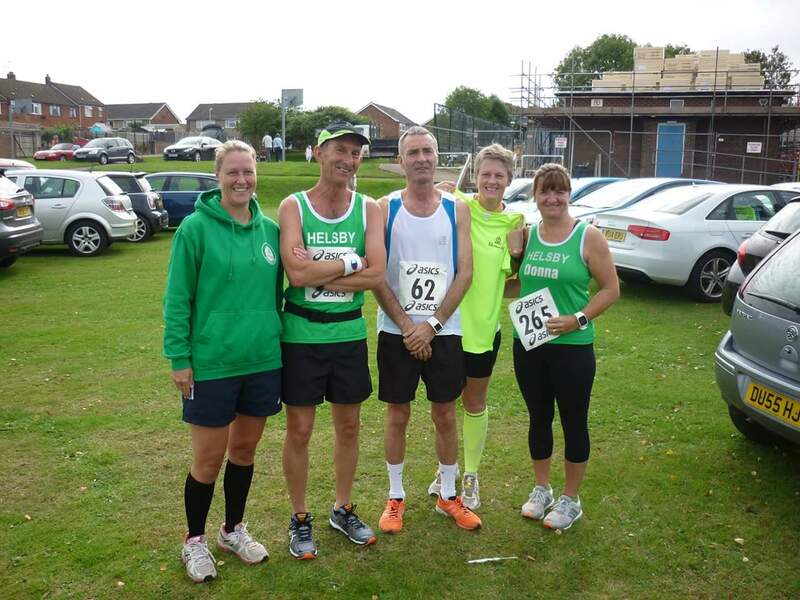 There was a good contingent of 13 Helsby runners at this year’s Sutton 6 10k race, with some new PB’s for some! This was the 33rd event of what originally started as a 6 mile race to raise funds to build Guilden Sutton Village Hall in 1982. More importantly this year the race was a club ‘counter’. Weather conditions were good for running, with a light wind, the sun disappearing behind the clouds before the race started. This year the race was chip timed for the first time. This seemed to lead to a few problems it would seem! Rather than the now common chip on the number, or disposable shoe tag we got the older reusable button chip worn on the ankle with a Velcro belt! Of course it’s always a good idea to make sure the chip is attached to you before the race starts rather than left somewhere else! The course is mainly flat finishing on a slightly lower elevation than where it starts. However there is an incline from the junction of Wicker Lane/School Lane up Porters Hill into Oakland’s for the finish. If you don’t know the area this little hill (by Helsby standards anyway) always seems to catch people by surprise. As someone said to me later they ‘weren’t expected that in an area which looks so flat’! Fitzy leading the chants of ‘Green Army’ at the start, apparently that’s normal I understand. Although he didn’t appear to have his special water bottle this time. I hoped this wouldn’t affect his performance, or the five Guinness and the large Chinese he consumed the night before! The race got underway, as usual Jo and Mario making their customary encouraging appearances at different points around the course, and my resident photographer trying to catch everyone in Hare Lane. The pictures are now on Facebook. I don’t know how Jo Lacking managed to elude the camera by the way! An added attraction this year being, West Cheshire marshal Kay entertaining the runners with her cow bell in Wicker Lane! 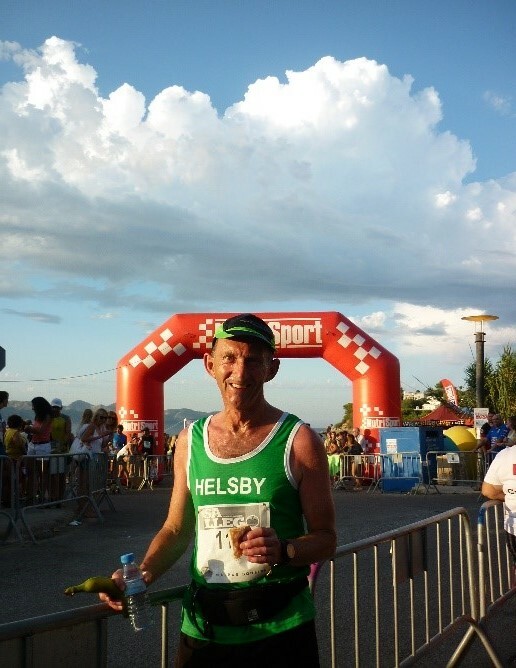 First home for Helsby was Chris Fitzpatrick in 19th place, 1m 06s faster than his time on last year’s Sutton 6. Adam Gordon 2m 15s faster than last year. Fortunately for Adam the organisers have accepted his time and he wasn’t disadvantaged without his timing chip! First Helsby lady was Jo Lacking. Without doubt the two star performers of the day with new 10k PB’s were Jo Farwell who took a massive 3m 24s off her time in the Ellesmere 10k, and Tanya who took 1m 20s off her Ellesmere time! Well done ladies! Ed – Nice work Fitzy, the first of the post heavy night performances! The Warrington half (or the English Half Marathon as they like to call it) received headlines last year primarily due to the incredible extras Gareth Boyd was treated to by paying extra for the VIP treatment (might be worth speak to him before signing up :)) however this year the headlines are for all the right reasons. Thanks to Jane Bishop and Neil Hughes for on the ground details. In brief: Great conditions for it, cool and fresh with the sunshine breaking through, plenty of spectators lining the route, a new course this year starting near to and finishing at the Golden gates…Certainly one to consider for next year. All you need to know really! Well, ok if you want a little more then how about new member and long suffering wife of Chris, Gill Fitzpatrick, smashing out a new PB; comfortably dipping under the hour in 57:34; fantastic running Gill! Still not enough? Well Helsby’s own lightening bolt Colin Bishop came in 2nd overall and 1st in age category with a time 35.02 – with so many fantastic performances it’s easy to take such results for granted and miss just how much Colin puts into his running so it’s nice to see the rewards being reaped by the fastest M50 in the country! PBs weren’t just restricted to the half, Neil Hughes stormed around to pick up a new PB of 1:48:36. Huge congratulations. Pos. Name Gun Time Chip Time Chip Pos. Gender Pos. Cat. Cat. Pos. Not sure what race it was, but here is the race report from Roy that he posted on Facebook. Please read the instructions at the start of the post Roy so next time there is no chance of us missing your results. Well done Roy, great to see you back racing again. Details for this fell race are a little vague as it would appear the organisers haven’t mastered the internet… or even know it exists as there was no amount of googling that could return me the results or even any details other than other clubs like ours mentioning it as a good one for an entry into fell running. This means that unfortunately I don’t have the results yet, but we’ll ensure that once we get them we’ll get them put up on the blog for the long term record. This race was the last of the new to fell mini series which has proved very popular within the club – certainly something to continue next year in one form or another. It’s resulted in plenty of wide eyed looks and stories of trauma, but above all dramatic scenery, smiles, exhilaration, soup, cakes and post race libations! … plus more than one additional member of the #Fellsby subsection. More than 10 green vests turned up for King John’s castle fell race on a fabulous sunny Sunday. The field was pretty small with teams from Helsby, Denby and Buckley battling it out. The 5 mile course ended up nearer 6 as most of us went a bit wrong but there were no tears and we were all still smiling at the end! Well done to Emma Barns who completed her first fell race. A great one to try next year if you want to join team #Fellsby. Adam Gordon managed the second of two gaffs for the week by throwing away first place due to a wrong turn, allowing Jim Jones to take the spoils for Helsby. I’m so sorry that there are no results out so I can’t tell you who came in first that was competing in the New to fells mini series from the gents. On the Ladies side, Laura Baynham-Hughes was first lady back for Helsby and first for the new to Fells mini series on the day. Laura’s performance marked the second piece of annecdotal evidence that the route to a great performance is in the prepartion the night before (Seen dancing in Rosies at 2am on the morning of the race meant Laura arrived with just minutes to spare after being convinced that the best hangover cure was a fell race). Fantastic performances all round by the sounds of things. No races, but remember the season is coming up soon so get your spikes ready! The timings remain the same, 6pm registration, 7pm start. Soup and a roll £1, free parking. Also, please make your members aware of the minimum equipment list and the requirement to abide by the rules laid down by the Welsh Fell Running Association. In order to control the number of people entering can I ask that this be kept within the running club scene as much as possible please. 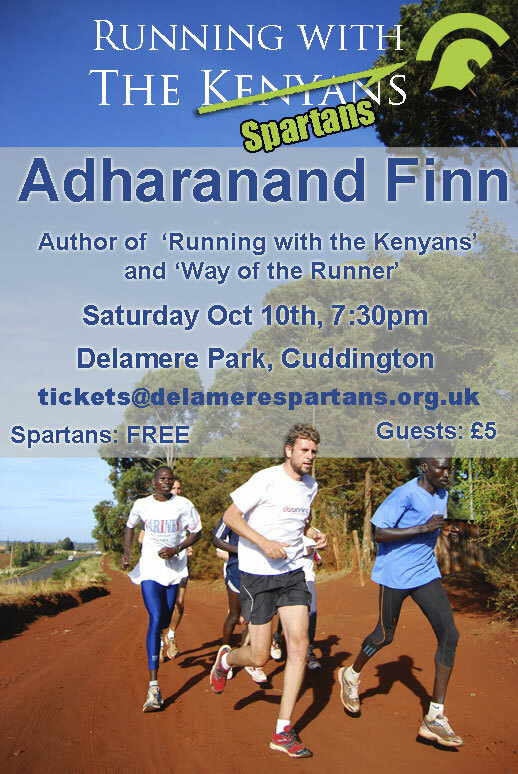 Adharanand Finn, author of ‘Running with the Kenyans’ and ‘The Way of the Runner’ is coming to Sparta! He’ll be visiting the Delamere Spartans on the evening of Sat 10th Oct to talk about his experiences training with elite athletes in Kenya and Japan. There will be beer! Places are £5 for guests and non-members. This won’t be a mega-technical talk and should be a good night out for partners etc. Did I mention beer? Book your place by emailing tickets@delamerespartans.org.uk or posting below. Should be great – he’s a good writer and has spent time with the best distance runners on the planet! It was quiet week for Helsby members Parkrunning, with runners out at Delemere and Widnes, The stand out performance was Neil Finegan coming 2nd at Delemere being just edged out by the mysterious “Unknown Runner”. Full details of the weeks performances from Helsby members can be found at the link below. Next its on to the race reports. Did the Langdale marathon Saturday. Only signed up last minute as had a free Saturday and saw it written up as “among the toughest road events in the UK. Exceptionally hilly” – so thought I’d give it a go. Turns out there was 3000ft over 26 miles so it was certainly undulating. Heavy rain up until the start but it stayed pretty light for duration of the race which was two laps of a half marathon route. Some 329 runners set off from Dungeon Ghyll and it was a bit weird trying to work out who was doing the half or the full. As I finished my second lap and saw most of the cars had gone it turned out only 85 had done the full marathon and i’d finished 24th in 4hrs 4mins. It was a well hosted event with chip timing and only cost £20 to enter. Also a fantastic free sports massage provided by Louis Mackay afterwards. An army of 1 green vest took on the Wirral half marathon. The echos of “GREEN ARMY ” rang around in my head as the race started. Its a nice course and maybe one for next year’s fell calendar as I had to run up a hill at least 15 yards long as well as running on about 10 yards of sand and 100 yards of stoned pathway made it a really tough race ? Weather was great and it’s a really good course with nice views along the coastline. 1.30.08 for me. This is a half marathon that I have wanted to run for a while but never got round to it when it was a club counter. A fairly flat course that feels like it is gradually going downhill for about 10 miles! Beautiful scenery with the route circling the lake and crossing the dam, well organised with a village feel. I have to say I much preferred this half to Warrington half although due to the 1.00pm start and distance it is a full day commitment. Pleased with my time of 1 hour 47 and 476 position out of approximately 1500 runners, perfect conditions with little wind and a pleasant temperature. Maybe it can return as a club counter in the future? Jo Lacking was first home for Helsby. Thanks for the reports, everyone. Ian Hamling and Rachael Holden ran the Great North Run on Sunday, congratulations to both for completing this iconic race. Max Wainwright and Phil Roberts ran the 50km Lakes Sky Ultra over some of the most challenging terrain on the Lake District with Max finishing 222rd in 10:19 and Phil 34th in 11:52. Great going lads. There was a great Helsby turn out for the 3rd race in the Multi Terrain series. Full results and team standings are at http://www.stevesaunders,co.uk. Apologies for the lack of pictures but I’ve had intermittent Internet for the last few days and had to put a lot of this together on my phone which has limited what I can do. A very busy week of racing for the green army so lots to report! 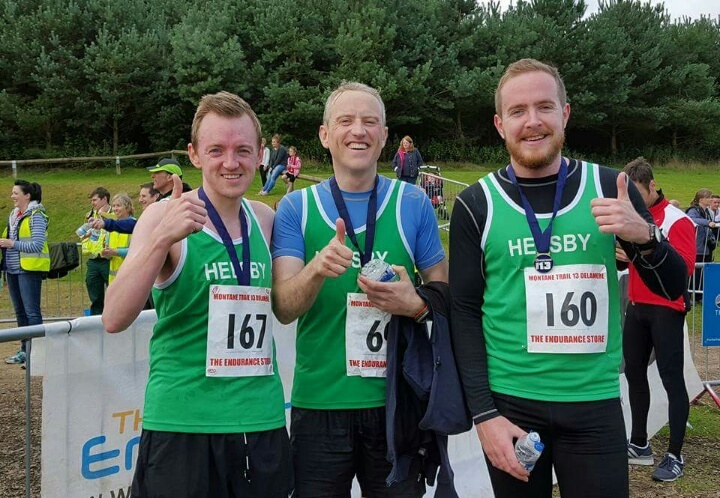 Thank you for all the race reports, if there are any more then please send to helsby-race-reports@outlook.com and I can always update the blog at a later date. Mini Fell Counter – Saturday 19th September – 11am – St Johns Castle – A 4.6 mile race starting in Lanarmon yn Ial with 865ft of climbing. A good introduction to fell running out near the Clwydian Hills with a lovely village pub at the end! Entries on the day and only a few pounds! Our weekly parkrun stats are below. Some good performances this week with a podium position for Janet and a new PB for Rachael! Well done all. The first of the muti-terrain races saw 12 helsby runners toeing the line in Thurstaston. A beautiful evening and perfect race conditions saw some excellent running from the Green Army. Congratulations to Max Wainwright who was first home for Helsby in 15th place overall and Jo Lacking who was first home for the ladies. The ladies are currently 3rd in the league and men are 17th. Nice to see some new faces on the night too, well done everyone. 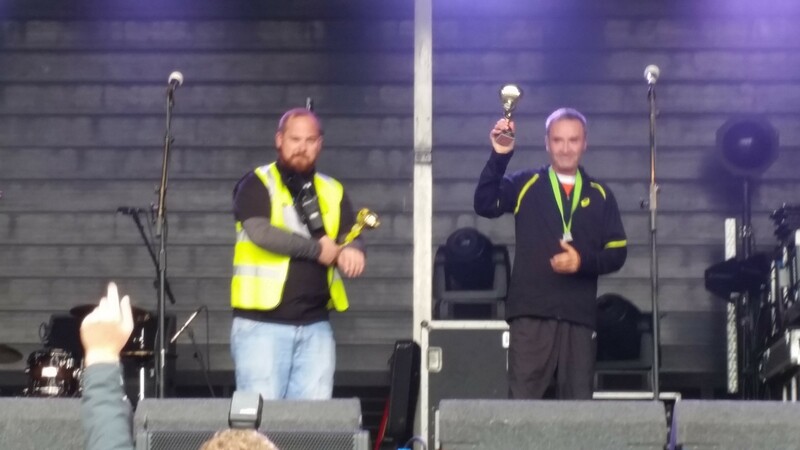 Ian Hamling was our sole Helsby representative at the HW5k this month and ran a stormer to break the 20 minute barrier for the first time. Well done! Ian is one of our newer members and has been training hard at the track each week which is starting to pay dividends in his race times. Quality training really does work so if you would like to get some speed into your training then join us at 6.30pm each Monday at Helsby High School. Dave Wiggins and I took on the Brenig Trail race on Saturday – nine miles around Llyn Brenig reservoir on the Denbigh Moors. The scenic course was mainly on stony or paved tracks, with a stretch of wet muddy footpath at the top end of the lake. Road shoes were the order of the day, and many people were cursing their way through the muddy stretch. The course was ‘undulating’ rather than hilly, but there was very little of it on the level apart from the heartbreaking last half mile along the dam where the finish never seemed to get any closer. The weather was fantastic, almost too hot at one point and I was grateful for a bit of shade when the trail disappeared into the forest. The race was nice and low-key, very well organised by Denbigh Harriers and marshalled by local cadets. The turnout was boosted by Wilmslow, who I assume were using it as a club counter and who made up almost a third of the field. It deserves support and it would be good to see a few more of the Green Army there next year. Special mention goes to Steve Wiggins who dropped (well, hobbled) in to support on his way back from the ROF, and bought the coffees as well. Not really a big fan of the trails but thought I’d give this a go being so close to home. Tough route – very hilly and muddy in parts. Shoe came off going through a particularly boggy patch and going up old pale at the end was a killer! I would have said definitely not a pb course but Chris somehow managed to get one! Well organised and enjoyable race. Really good training run for me but I’ll stick to the roads I think….. In its second year of running, The Montane trail 26 events at Delamere on Sunday had a choice of 2 routes looping through the central part of the forest and familiar to those who have run the parkrun there. A 10k and a half marathon choice, both run on trails finishing together with a final slog up the old pale – a 200 ft steep climb to take in the views before the downhill to the finish. The half route which I completed was a mixture of the main paths around the forest, combined with some real “off road” trails. The amount of rain last week made this a tricky and mucky experience but thankfully the knee deep puddle towards the end cleaned my legs at least. It was a tough route – only a 750ft climb in the course but the twists and turns made it difficult with the bad conditions under foot. Every time you started to get a rhythm and a bit of speed going you were diverted off again through the trees, dodging the swamps, tree roots and dog walkers. It was a beautiful September morning and the scenery made the race pass very quickly – but the popularity of the forest on a nice day with non runners added to the difficulty. It was a well organised event, the kids trail event at the start (complete with off road Hill climbs) was particularly good. A few more stewards and markers would have been appreciated in places but the race kept a nice small scale community atmosphere with 200 runners in the half and 148 in the 10k. The winner of the half set a new course record of just under 1h 18m. For Helsby Chris Murray knocked 5 minutes off his previous half marathon PB which is brilliant on a tough course like this. There was 1 Helsby runner in the 10k and 3 in the half all finishing very well. Tim Palmer has kindly sent in the following report for Cilcain, thanks Tim. The Cilcain Mountain Race saw a good Helsby turn-out – well a good turnout from the Men Vet 50s with Jim Jones, Phil Gillard, Ian Landucci and me. Chris Hatton and Andy Robinson were there representing the more mature members and Ben Fletcher representing others. The race itself is up to top of Moel Famau and back via a slightly different route. Unfortunately the results on the WFRA website have an Excel bug in them. From those and the info on the WFRA North Wales series, the following can be de-ciphered…. No reports for our 11th fell counter but I have found the results. Well done to Jimmy O’Hara on another strong run to take maximum points and Laura Baynham Hughes who was first lady home. Well done to everyone else who participated. 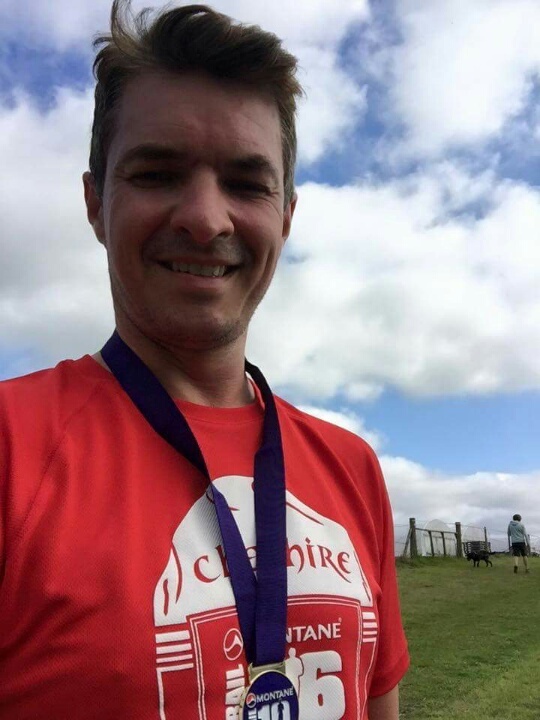 Finally a massive shout out to Gareth Boyd who completed the epic Ring O’ Fire race over the weekend. 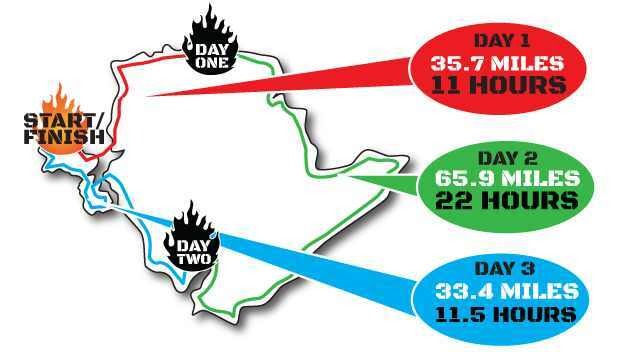 Ring O’ Fire is a 135 mile coastal ultra marathon circumnavigating the Isle of Anglesey over 3 days and is one of the toughest trail races in the UK. Well done from all at Helsby RC! Also commiserations to Ste Wiggins who had to pull out of the race due to injury, I’m sure he will be back to fight another day. We will be pestering Gareth and Ste for a full report when they have both recovered but in the meantime all results can be found here http://www.ringofire.co.uk/. That’s all this week, please let me know if I have missed any races or if you have any more reports please send them over and I can update the blog. Another fell counter for us in late August. Results tracked down here: Chipping Show15. Well done Phil G on coming in first green and looks like we managed 4th in the Men’s Team too! Welcome to this weeks round-up. A busy week of racing with a mixed bag of races but lets get started with some reminders first. Don’t forget it’s the Wirral Multi-terrain race series this month with the first one tonight (1st Sept). A great little race series which are not too challenging (generally 5 miles) and a good warm up gig for the cross country season ahead. 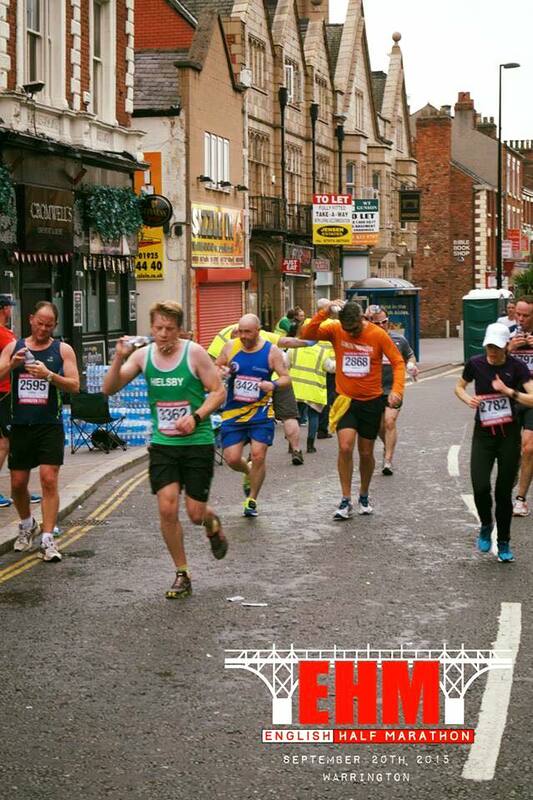 We need 5 men + 3 ladies to make a full team and at £1 per race they are a bit of a bargain! All details can be found here http://www.stevesaunders.co.uk/mterrain.htm. Tim Palmer has kindly put together a comprehensive race calendar which can be found in the pane at the side of the blog under “2015 event listing / race calendar” or by clicking this link https://helsbyrunningclub.wordpress.com/2015-event-listing/. It’s an excellent resource of information and has all the clubs counters plus other races listed. We had our 10th road counter of the season at the Ellesmere 10k on Sunday (how time flies!) with a somewhat low attendance from the Green Army, which was great news for those looking to grab some club championship points! Excellent running from Chris Murray who bagged himself a new 10k PB (after eventually finding the correct Ellesmere!) and the ever resilient Bish getting a top ten finish and age category win. Well done to all who took part. “Initially I thought this race was in Ellesmere Port not knowing there was an actual place called Ellesmere so leaving what I thought was loads of time I only managed to arrive a few minutes before the start as people were already lining up to race. The weather was great and not overly warm which was a nice change from the humidity of the previous days. The course itself was relatively flat and started from Ellesmere school meandering along country lanes and scenic tow paths with the finish back the school. A nice coffee and a cake at the finish sealed a great race and a great day. Geoff Collins also ran a 10k on 22nd August at the end of his holiday in Mallorca! He has sent in this excellent report, thanks Geoff and well done. “SA Llego 7 Malpas-Bonaire, Mallorca – 22 August . 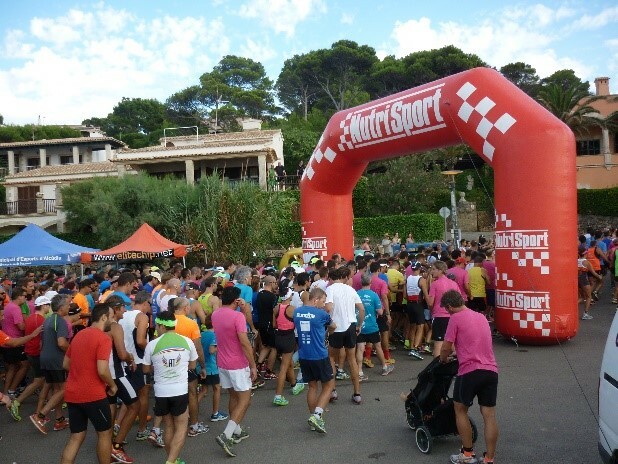 What better way to spend a Saturday evening at the end of a holiday in Mallorca – a 10k race! So my green vest had another outing – this time in Bonaire (pronounced Bon-eye-ray). 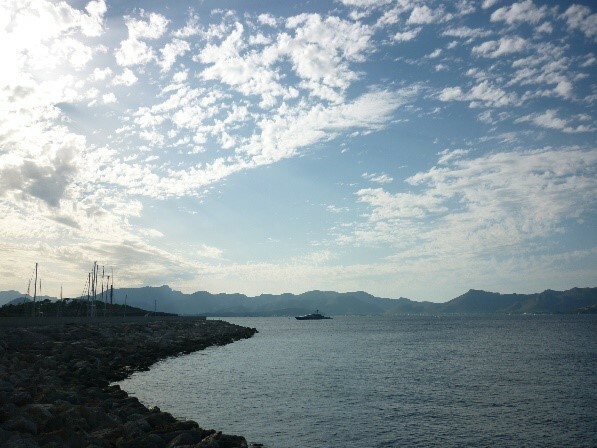 It’s a very attractive quiet coastal resort in the hilly North East of Mallorca not far from the old town of Alcudia. Bonaire sits below an imposing hill called Talaia d’ Alcudia. A hill well worth climbing for the stunning views towards mainland Spain. The 462 runners, just a hand full of English but mainly Spanish set off at 7pm, even at that time it was still really hot, over 30 degrees C! The route takes you out on the (closed) main road climbing uphill towards Alcudia before heading down into the town along the shady back lanes. Then you head towards Marina Manresa round the very pretty bay along the seafront path, off road and up over the headland more uphill and finally downhill to Bonaire. I managed to overtake Miguel a runner and local celebrity – judging by the excitement of the spectators. I ran with Miguel earlier in the holiday – more about that later. I finished in just over 46m, a lovely scenic run not technically difficult, but very challenging in the heat! Entry cost was just 11 euro’s, for that I got a plum coloured tech t-shirt, chip timing, with plenty to eat and drink afterwards! But no toilets not even one portaloo! Oh well a scramble down the rocks for the customary pre-race wee was unavoidable but the view was spectacular! Miguel is one of the leaders of an organisation called Runny knows – the way in Mallorca. They organise guided running for tourists in the Pollencia Alucudia area. Organised by Johanna MacDonald a very friendly enthusiastic English runner resident on the island. Fortunately runs start early in the morning when it’s not so hot. I and a group of like-minded runners from all over the UK got together for a couple of very enjoyable runs, this year starting and finishing on the beach. An incentive being to get your clothes off at the end and into the sea! We even shared a bottle of sparkling wine on the beach; it really doesn’t get much better than that! So UTMB turned into my second ever DNF. I loved it though, what a race! The course is amazing, although very groomed trails compared to the UK, that’s not such a bad thing for 105 miles. In the end though, I couldn’t control my body temp. My guess would be it was in the thirties even at 2500m and with no shade for almost the entire race it meant I got too hot, spent 45 mins trying to reduce it and must have looked bad judging by the degree of attention I was getting by the aid station team. I carried on and the heat increased further still (~35deg) stopped sweating, chundered, spent over an hour trying to reduce it and to up my blood sugar from “not critical, but borderline”. Flipped to shivering. Made the decision to continue, but then changed mind as I filled bottles and realised I had no interest in the food and wouldn’t going forward. It had taken 25 mins to decided to go on. Would have been 12 hour walk and a pyrrhic victory for me. I could easily have had a full night of sleep and started again the next morning, but that’s not why I was there. Delayed Aftermath for me included a disturbed night of violent projectile vomiting and sleeping on the pavement of an airre like a tramp just outside of Dijon. Don’t regret any of it though, I loved every minute of the race, ran it as I wanted too, was blown away by the beauty of the trail and the pageant of ultrarunning. Amazing. 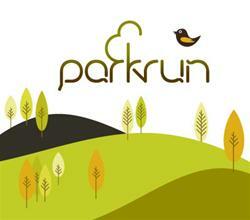 Please find the results below for the Saturday parkruns. Well done to all who took part. Finally our resident party planner Chris Fitzpatrick has asked me to remind everyone about the forthcoming knees up on Friday. The plan is to catch the 6.30pm or 7.30pm train to Chester for a 7-8pm meet in the Old Harkers Arms just off City Road. It promises to be a brilliant night! All are welcome to join in the shenanigans. That’s all this week. Many thanks to those who sent in race reports this week and remember any future reports can be sent to helsby-race-reports@outlook.com – they help massively in compiling the round-up for the week and are very much appreciated.